Hindu Existence Media Watch reports from Dhaka: In the series attack upon the Hindu Temples in Bangladesh in recent months, aiming to frighten the minority Hindus there and to grab the Hindu temple properties within a so called secular regime of Awami League Govt. headed by Sheikh Hasina, latest feed back came to us about a total resentment of the retaliating Hindus in the nefarious design of burning of “Srimad Bhagabad Gita” in the temple complex of Sribas Angan in the vicinity of Beyani Bazar of Sylhet district. 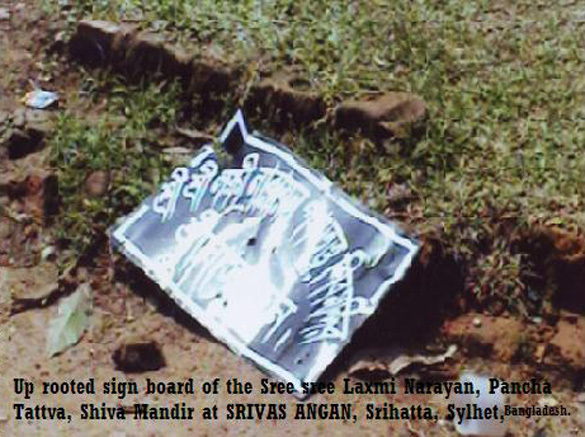 Before this culpable act the Islamist perpetrators destroyed the ancestral deities of this “Sree Sree Lakshmi Narayan”, “Lord Shiva” and “Radha Madhav Jiu” of Achray Sribas Swami, a great Sanskrit scholar ever and the champion companion of Sree Sree Chaitanya Mahaprabhu (1486–1534), a great spiritual leader in India for his Bhakti Movement. The ancestral complex Sribas Acharya is considered as a heritage monument and famous Tirtha Khestra (pilgrimage resort) for Hindus comprising with very old “Sree Sree Lakshmi Narayan Mandir”, “Pancha Tattva Mandir”, and “Siva Mandir” was destroyed by the local Mohammedan land grabbers and perpetrators. On 02.04.11, morning at about 10.00 am in broad day light, local influential perpetrators and land grabbers backed by ruling parties burned at least ten copies of Sreemad Bhagbad Gita with many religious books in front of local people after rampaging the whole pilgrimage complex to ensure a Islamic capture over a Hindu rights upon a temple property(Devottar sampatti). 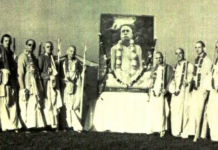 The fanatic Mohammedans successfully tried to destroy the relics of famous library building of Srivas Swami where a good collection of Hindu classic literatures and scriptures were the main attraction for the erudite students of the Master Srivas, across eastern India. It is believed that Srivas Swami started here an indigenous block print method (printing press) to copy old Sanskrit Texts. 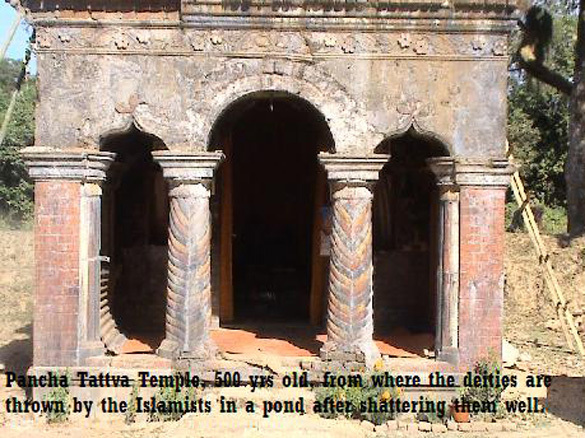 For a very unfortunate fate of the Hindus in Bangladesh all these historical and religious monuments have almost been perished into the Islamic aggression and the Government negligence. After the traumatic burning of Sreemad Bhagbad Gita and other religious books and the rampant rampage of deities and temple properties, the area of incident of Khasa Pandit Para, Beyani Bazar, Sylhet (the old historic SRIHATTA), tension raised a level of retaliation and the aggrieved Hindu locals lodged a FIR in Biyani Bazar Police Station vide no. 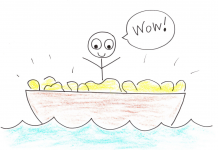 03/02-04-2011, u/s 143/448/294/323/379/380/506. 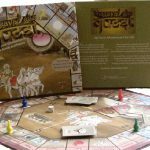 It has come to know that one Janab Dipu Sheikh and his gang have been operating to encroach the entire five bigha (1.65 acre) of this temple property. 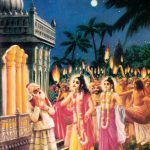 The Muslim attackers tried to murder Sri Siddha Gaur Das Brahmachari the monk-in-charge of the temple premises and throw away all the broken deties into a nearby pond after rampaging abruptly. The perpetrators also snatched away the donation box of the main temple. Janab Dipu Sheikh maintains his political connection with Awami League and Jamat e Islami – Bangladesh, both hand in hand. Dipu has open criminal connection with Islamist to run his persecution program upon minority Hindu women, Hindu shopkeepers, general Hindu minorities and Hindu land grabbing. One Sabul Ali of Dipu’s gange physically assaulted Siddha Gaur Das Brahmachari and attempted to murder this monk-in-charge. The political affiliation vested in Dipu’s group made them a terror to the Hindu locals. 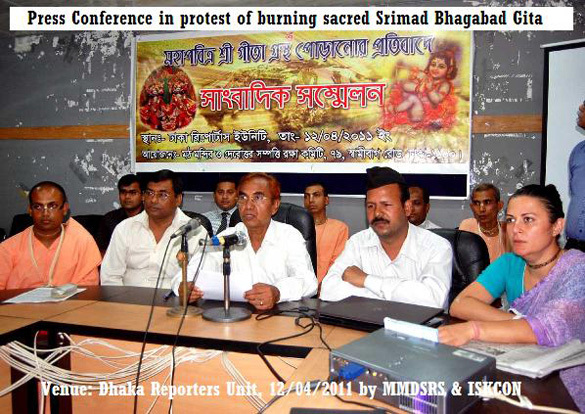 In a protest the Math Mandir O Devottar Sampatti Raksha Samity (MMDSRS) of 79 Swamibag Road, Dhaka -1100, held an urgent press conference on 12th April 2011 at 11 am in the Dhaka Reporters’ unit, VIP Lounge, Segun Bagicha, Dhaka to draw the attention of all concerned to protect the growing torture upon Bangladeshi Hindus along with their temples, landed properties, business, women folk and even animals possessed by them. 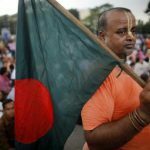 In a very anguished PRESS statement by MMDSRS, its convener Satya Ranjan Barai conveyed that the paramount cry of the Bangladeshi Minority Hindus do not touch even any civil society of Bangladesh, which denotes its fake secularist attitude to the damn apathy to a Hindu persecution and ethnic cleansing. 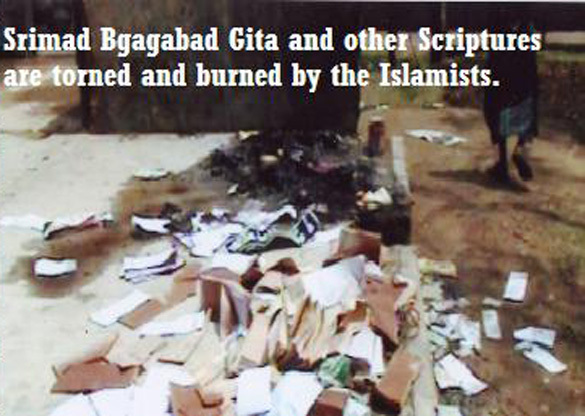 Prominent Hindu activists present there demanded immediate arrest and punishments of the Muslim perpetrators caused a hell and burning of Srimad Bhagavad Gita in Srivas Angan. 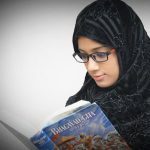 In the press note MMDSRS accused the present Enemy Property Act and its Amendments, which fueled all the Muslims to grab all Hindu properties as Muslims consider Hindus as enemies. And this is the stand point of a so called liberal Govt in Bangladesh. In the press statement, convener of MMDSRS pointed out in the recent past, the 200 yrs old Radha Govinda Jiu Temple at 222 Lal Mohan Saha Street, Sutrapur, Dhaka is under the Islamic scanner to grab it. Land Mafia Hazi Islam Uddin, Hazi Afjal Hossian and local Awami League President of 77 no ward, Hazi Abul Hossian Abul clubbed together to occupy the temple forcefully. Their men have been threatening the temple authorities as Hindus must close all Muth (resident of monastic orders) and Mandirs (temple) to ease the land grabbing by these Muslim Land mafias in BD. (vide GD no. 1841 dt 28-03-2011 of Ramna Model P.S.). 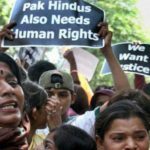 In Rampura area of Dhaka, where 220-225 Hindu families reside, one Rajauk Ali encroached 75% land of a Hindu crematorium beside the “Sree Sree Gouranga Maha Pravu Mandir”, Now Rajauk is trying to occupy the lone Hindu temple of this area, for which Hindus are determined to fight Land Grabbing Jehad in Bangladesh. It is also reported that the Awami League MP Jajid Malik has destroyed one temple in Urkiya, 2 km away from Manikganj town to vacate a Hindu possession of Golak Mondal and Sarat Mondal for a proposed hospital there. In the name of so called development, hospitals, cattle houses, slaughter houses, multi storied buildings; the Hindus properties are being snatched, even not giving a minimum price. Pointing out an overwhelming discrimination to Hindus, it is told that when a Madrasha educated teacher gets his salary in a regular scale, then a Sanskrit scholar gets an honorarium of only Taka 120/- pm. As the Muslims claim their superiority in BD, Hindus there are treated as III class citizen. These Hindus also fought a brave fight and got tremendous torture from Pak platoons at the time of struggle of Free Bangladesh. The Math Mandir O Devottar Sampatti Raksha Samity has a plan to protest and hunger strike all over the Hindu pockets in BD. ISKCON Bangladesh is very much aggrieved as the maximum attacks are held in the Vaisnavite Goudiya Temples. On behalf of MMDSRS, Pinaki Das, a Hind activist of BD forwarded a mail demanding justice in favour of BD Hindus as : ”WE DEMAND PROPER PUNISHMENT TO OUR GOVERNMENT. PLEASE HELP US AND CREATE PRESSURE TO THEM FOR INITIATING PROPER STEPS.